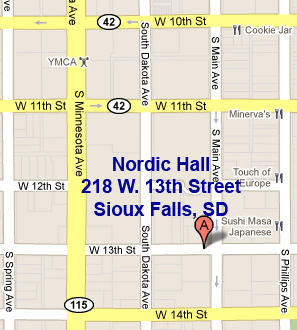 The Nordic Hall on 13th Street in Sioux Falls, SD rents several offices. The floorplan shows the layout of the main level offices. As shown on the floorplan, several of the offices are already occupied, and some are available for rent at this time. The Nordic Hall also rents a lower-level Banquet Hall to groups or individuals for special events such as wedding receptions, anniversaries, dances, banquets, and other celebrations. The lower level features the large Banquet Hall plus a kitchen and additional restrooms on that level. The maximum capacity for the Banquet Hall is 330 people. For people who need help maneuvering stairs, there is an alternate entrance off the kitchen that has fewer stairs. Please click on the Banquet Hall link in the menu list for more information.